There is nothing can beat the joy of backpacking to East Java, Indonesia. There will be various amazing spots to experience in such island.One of the most precious places will be Ijen Crater. Though it is always challenging to go to a place without a plan, the backpackers still need to use a guideline. However, the backpackers will still need to deal with a tidy preparation. They have to compile a reliable rule to get to some places. So, How to get from Bali to Ijen Crater? In Indonesia, maps are not available at every corner of a city. Besides, GPS cannot always provide efficient information about certain directions. Drivers often find a more complicated route as they follow what GPS suggests. The roads will not be incorrect. However, the routes are usually not so efficient. Most of the time, the routes will take more time which is frustrating. Therefore, when backpackers want to enjoy their Bromo Ijen tour from Bali, it is important that they search the information before leaving. It is no longer a secret that the public transportation is not so convenient in Indonesia. In finding way How to Get from Bali to Ijen Crater, tourists should therefore pay attention to this issue prior to taking the routes of their journey. For instance, there is no train in Bali. So, the backpackers have to get prepared with more money for a short distance transportation. It is more efficient to rent a motorbike so they can save in their transportation cost. Taxis are everywhere but the cost will not be that cheap. Yet, there is now several choices of online taxi application to use. The online drivers will be ready to help the tourists to get back to the hotels after a trip. The journey How to Get from Bali to Ijen Crater will start from Gilimanuk Port. This is a small port that mainly transfers tourists from Java to Bali and vice versa. This is one of the busiest ports in Indonesia. This is so because Bali is so attractive not only for the international tourists but also Indonesian. Bali is still the main tourist destination for group tours. Almost all schools in Java and even other islands love to set a plan for a big trip to Bali. Therefore, it is not recommended to travel to Bali during high seasons because the locals will head to Bali together and make many tourist destinations so crowded inevitably. In Gilimanuk, tourists can reach Banyuwangi within some hours. Banyuwangi is a region located on the tip of East Java. It is possible to take a bus to get from Bali to Banyuwangi for enjoying the beauty of Ijen Crater. 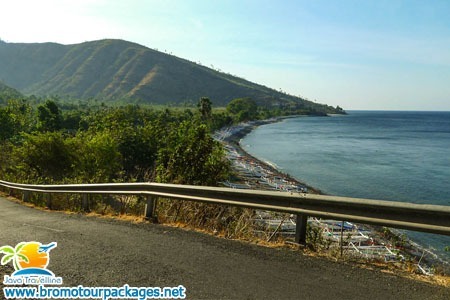 It takes approximately 2 hours from Gilimanuk to Ketapang, the port in Banyuwangi. However, there is now a new option of a fast ferry that enables people to reach Ketapang only within 30 minutes from Gilimanuk. It is also possible to start Bromo Ijen volcano tour from Bali by planes. However, there is no airport yet in Banyuwangi. So, tourists can only go to Surabaya first before leaving to Bromo, Banyuwangi and then Ijen crater. After that, tourist can take another bus to go to the hiking point, Paltuding. The route of Ijen Blue Fire tour from Bali takes 30 kilometers to reach Ijen National Park, in which the volcano is located. It is more efficient to go to Ijen from Banyuwangi. The volcano is located in two regions: Banyuwangi and Bondowoso. However, Ijen is located 76 away from Bondowoso. Reaching the Paltuding, tourists can start the preparation to hike the volcano. It is only 3 kilometers but the landscape is a little challenging. However, the view along the track is gorgeous. So, travelers will never get too exhausted. In the middle of the track, there will be a scale, at which sulfur chunk miners will stop by to measure the weight of their chunks. If you are among tourists who love to enjoy the tour and travel time in most convenient way. You don’t need to be worry about How to Get from Bali to Ijen Crater. Taking a tour package from agent will suit you best. Travel agents have affordable packages of Bali tour with private cars. The service will include Banyuwangi and East Java tour if the travelers want to extend their vacation. Besides, the tour will include a transportation to reach the next destination. So, if the tourists want to leave Bali to other destination in Banyuwangi, they can leave tout arrangement to the tour planner. That is How to get from Bali to Ijen Crater you need to know in planning a hassle-free tour. Tour to Ijen Crater will remain an unparalleled experience regardless of which route to take to start the tour.